Many adults struggle with the decision to get swim lessons because they are shy or even embarrassed by their swimming skills. Learning to swim later in life can be a fun and richly rewarding experience! The Three-Step One with the Water Guided Mastery Swim Program works every time! Our instructors have used these methods to teach thousands of students to master their swimming skills with 100% success. By helping you become One with the Water, we help you to live a healthier, happier life. The journey to mastering swimming begins with making you feel comfortable and secure, creating the perfect learning environment. We will guide you step-by-step to master the skills of breathing, balancing, kicking, and pulling while increasing your courage and confidence. Becoming One with the Water is an achievement worthy of celebration! The One with the Water community will join with you to celebrate your new skills and freedom in the water! I’m a Navy Veteran who ironically was never taught proper swimming techniques. The instructor’s teaching style couldn’t have been better. She quickly made me confident in my weaknesses and instinctively knew when I was ready to be pushed, even before I realized it. The result: I was swimming by the third-class! I was overjoyed. I now know a freedom I never knew and have a strength I never had before. I’ll never forget my first swim lesson with Kenneth of One with the Water. He asked me to kick with a kick-board: I went backwards! As a 40-year old who desperately wanted to become a better swimmer I was extremely lucky to find Coach Kenneth. Six months later I am swimming 2000+ yards per workout and I am proficient in all four strokes. Coach Kenneth is an outstanding teacher and motivator. I feel so lucky to have trained with him. Below are some of the most commonly asked questions regarding our Adult Swimming Lessons. If you have any specific questions that are not answered here, contact us and we will be happy to answer them. How long will it take me to learn to swim? Typically, adults learn to swim in four to five hours of classes. We teach the best and most efficient approach to the most pertinent skills of swimming: Breathing, Balancing/Floating, Kicking, and Pulling. We break it down to simple achievable goals to help everyone succeed. Even if you have fears of the water, usually within the first lesson you’ll be breaking through those fears and swimming on your own. Do you teach advanced lessons? We are expert teachers and swimmers. Most of the One with the Water instructors have over 20 years of experience teaching swimming lessons. Our coaches have trained IRONMAN participants, US Paralympic swimmers for international competition, and US National Swimmers for the Olympics. What do I need for lessons? A swimsuit and a towel is all that is needed. No flotation devices, flippers, masks, goggles, etc., are necessary. We can provide you with a swim cap. Should I eat before the lesson? If you use sunscreen lotion, be careful when placing it on your face and around your eyes. Sunscreen will irritate the eyes when wet, not the chlorine. Can you help me prepare for competition? 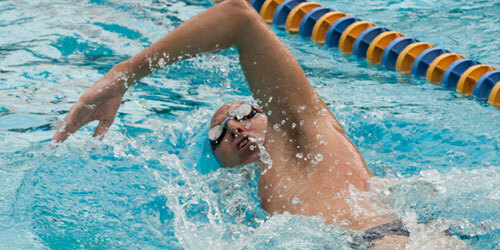 Our coaches train triathletes, IRONMAN athletes, US Paralympic swimmers, and US National Swimmers. We are fully trained and ready to coach you to competitive success! If you require any special accommodations that can only be provided in private lessons or by our Adaptive Sports Swim Team Coaches, then we can provide that, in accordance with Federal Law. Special accommodations are made for babies, all children under the age of 19, those who may have a fear of water, those unable to support themselves in the water, or any child that does not learn well in a traditional group class. Additionally, special accommodations are made for any unseen disabilities that can fall into any one (or more) of the following categories: Medical, Mental, or Psychological. In general, difficulties for individuals with special needs, struggle in areas of language (ESL), mobility, learning, and self-help. Some of the most common: ADD/ADHD, Anxiety (Social Anxiety, Separation Anxiety), Auditory Processing, Autism/Aspergers, Depression, Developmental Delays, Intellectual Disability, Sensory Processing, Language Disorder, Learning Disabilities, Obsessive Compulsive Disorder, Seizure Disorder, Emotional/Behavior Disorders (Oppositional Defiant Disorder, Disruptive, impulse-control, and conduct disorders, Intermittent Explosive Disorder), Neurological Disabilities, Physical Challenges, PTSD. This list is not inclusive. For further information on this, please read https://www.ada.gov/pubs/adastatute08.htm/. For the monthly membership fee, you are guaranteed either 4, 8, or 12 lessons, depending on the package in which you enrolled. For months with additional days, when 5 Saturdays, Sundays, or Mondays, etc. occur, the rate will remain the same. When a pool closure occurs and there are only 3 or 7 lessons, you will receive a credit to use in the upcoming month. Refunds are not issued.